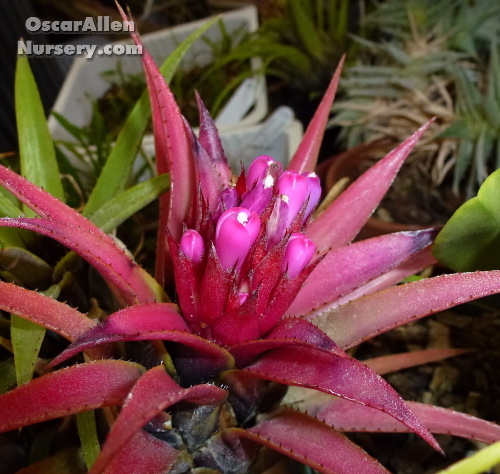 Tropical plants — bromeliads, orchids, antheriums and more. Meticulously bred for more than forty years by Oscar Allen. Aechmea recurvata var. benrathii is a rock dwelling species from Brazil. The variety benrathii differs from the type plant in having compact stature and very dark purple leaf bases that give the plant the appearance of being black at the base. the leaves have compact spines. With the approach of flowering the entire top of the plant blushes from a light pink to vivid red depending on the clone. Individual flowers have red petals and extend only slightly above the stiff red floral bracts. These plants grow best in strong to very strong light and can tolerate a considerable dry period. They grow easily and rapidly into sizable clumps and bloom freely.